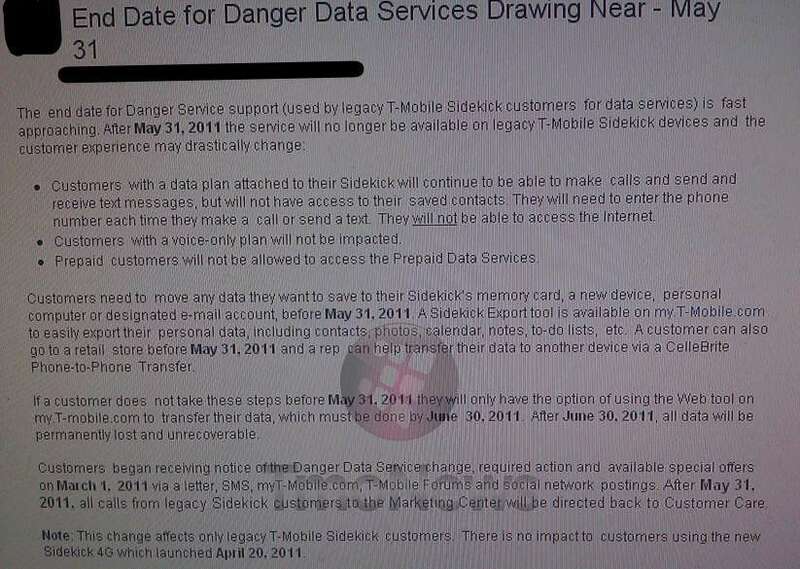 T-Mobile wants to remind us that coming May 31st, 2011 Danger Service support for legacy T-Mobile Sidekick customers will come to an end. We’re sorry to see the Sidekick line fall into nothingness having been one of T-Mobile’s great success stories and perhaps one of their greatest handset triumphs. After May 31st customers with a Sidekick data plan will be able to make calls, send and receive text messages but will not have access to their contacts or any other data services. Sidekick users will want to immediately begin moving their memory to a new device, computer or email account before the clock strikes 12 on May 31st. Thankfully T-Mobile has provided an export tool on myTmobile.com so Sidekick owners can easily export personal data including contacts, photos, calendars, notes and to-do lists. Between May 31st and June30th, customers will still be able to export personal data using the web tool however after June 30th all data will be deleted as the Sidekick data center closes permanently. We’ll miss the Sidekick line and the dancing commercials the Sidekick LX brought us which we’re sorry to say are infinitely better than the rapping white guy. At least we’ll have the Sidekick 4G which carries on the Sidekick name in body and now powered by Android. Our friends over at GeekWire have a great rundown of the Danger to Android transition which is a fun little read. Thanks for the memories Danger, we’ll miss you. Lived through (and loved) Sidekicks 1, 2 and 3 – its weakness was always the back-end data. Pairing Android with the Sidekick form factor is genius – looking forward to see where its evolution takes it. At last the Danger team is over at Google working on Android. M$ ruined Danger and Hiptop. They tried to use the idea to create Kin but it failed. Hiptop/SK infrastructure is gone as a legend would come to the end eventually. I tried SK but I was not impressed because old Hiptop platform isn’t really smartphone platform. The scene of every black kids playing SK on the bus ended. Fortunately the new Android-based SK is much better than Hiptop platform. I still have the sidekick.. Will have it til the day it dies on the 31st.. Then will be replaced by the HTC Sensation..
Once again, a big company (MicroSquish) takes over a company and trashes it. We’ve seen this many times before with the likes of Yahoo (GeoCities), NBC (Xoom.com) and many many others. It’s very sad to see the Sidekick legacy come to an end. The end of an era. However, the new Sidekick device with Android is a great replacement, zippy and so much more responsive. I just hope all the exisiting legacy Sidekick owners have heeded the warnings. Sigh.. I remember the time I got original sidekick. It was December 2002. It was black/white screen sidekick. Then upgrade to original sidekick color which is first colorful screen on July 2003. Then I upgraded to Sidekick 2 in two year later. I was still using sidekick 2 in 2006. I was driving a forklift and my sidekick 2 somewhat fallen out of my pocket and forklift rolled my phone flat! After few days without sidekick 2, I upgraded to sidekick 3. Love the plastic keyboard! Next year later, I upgrade to Sidekick Slide. I really hate the Slide because it got glitchy and not stable to use it. Exchange it for Sidekick LX. Much happier with LX in late 2007. Two years later, I upgrade to Sidekick LX 2009 3G. Love it and have better hardware and features than all older sidekick. I was one of those people who lose my data due to Microsoft/Danger servers issues. Im a deaf person and I really ought to say that all Sidekick line were a good phones with awesome qwerty keyboard and I will be sad to see them go. Goodbye Sidekick and We will miss you. We have no choice but move on to newer phones such as Iphone, Android or Windows phone. RIP Sidekick line.